I'm headed to the Bay Area this weekend for the 27th Annual Labor Heritage Festival. The festival is located just off Highway 101 in Burlingame and there's plenty of convenient parking. It's also super accessible by BART. Check out the website (above) for all the details of what I'm sure will be an amazing and inspiring festival. 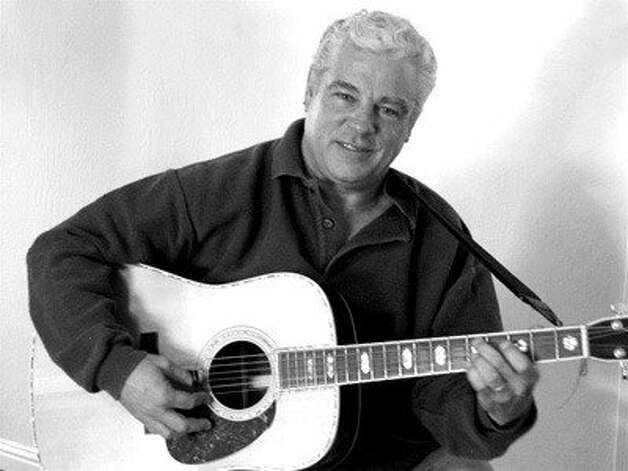 This year's festival is dedicated to Jon Fromer, a fantastically talented songwriter, guitar player and human being. His death on January 2, 2013 has us all bereft and grieving. We will celebrate his inspiring life and work at the Festival, and hope everyone who can possibly join us will be there. I think 2012 was a great year for film. Beasts of the Southern Wild, Searching for the Sugar Man, Looper, Lincoln (good, but too long), Anna Karenina, Argo, the Flight, the Arbitrageur, Silver Linings Playbook, The Master and Promised Land were all very entertaining. Haven't seen Amour, Django, Zero Dark Thirty, Les Miserables, the Impossible, the Life of Pi or any of the animated films yet. I am a little concerned at the pro-war content of Argo, Zero Dark Thirty and the TV show Homeland... entertertaining and disconcerting. 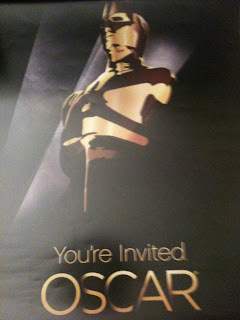 I will host my Oscars party once again. If you're interested in attending, let me know. I think I have 10 seats left. call 412-877-6480 or text or email me. We've already got some fabulous folks on board .. but all from the west coast... what's up with you folks who live east of CA, OR, WA and BC? I've been traveling regularly to Ireland since 1977. When I tell my friends about my Irish adventures they invariably say, “Oh, I wish I could have been with you!” Well, now’s your chance. Ireland is such an interesting country. Its extraordinary natural beauty, colonial history, ancient traditions, cultural heritage, beautiful music, friendly and charming people ... and now – thank goodness! – excellent cuisine and good coffee. I used to tour Ireland in a rental car and stay at B&Bs. Thanks to my experience leading 5 tours to Ireland in 2008 and 2009, I have come to appreciate the finer points of staying in a hotel. First, there’s no curfew – many B&B’s like to have you home at 10 or 11. And most hotels are conveniently located in town. Second, the food in the hotels is great, and many of the hotels have what they call leisure centers… they’re gyms, often with pools. And finally, as hotel guests we are welcome to the hospitality of the bar after the pubs close. We've had many a lovely singsong in the hotel pub upon returning from our evening out. It’s also a wonderful experience to tour with a small group. And they’re all folks on my mailing list… lots of interesting folks from all over the US, Canada, and often Sweden or Denmark. Join us and bring a friend or two! Cost is $2250 per person based on double occupancy (two to a room).$2600 for single room rate (single room option is no longer available on this tour). Cost covers nine nights’ lodging, ground transportation in our luxury coach, all breakfasts, three group dinners, music, island ferries, and heritage centers. Day 1. This morning we welcome everyone aboard around 9:30 a.m. after your breakfast at the B &B and then head northwards to County Mayo. Our first stop is at Coole Park, (http://www.coolepark.ie/), the home of famed Lady Gregory – a patron of the arts whose guests included James Joyce, George Bernard Shaw, W.B. Yeats, and many other notable Irish poets, writers, and playwrights. It’s one of my favorite sites in Ireland… a gorgeous walk, a great visitors’ center with a most informative DVD about the local history, a cafe .. a lovely place to visit. We’ll have a chance to stretch our legs before gathering in the gardens for a brief “go around” of introductions to our fellow guests and an overview of our itinerary for the tour. We then drive to the village of Cong in county Mayo for lunch (http://www.tourclare.com/cong.html). Cong is the quaint village where much of the 50's movie 'The Quiet Man' with John Wayne and Mara O'Hara was filmed (http://www.imdb.com/title/tt0045061/). After lunch we drive to the beautiful town of Westport where we’ll be staying for 3 nights at the CastleCourt Hotel (http://www.castlecourthotel.ie/). After settling into the rooms and resting up for a bit, we’ll meet for our first group meal in the hotel restaurant, followed by a private Irish music concert with a talented local musician. Day 2. In the morning we’ll hop on the bus and head to the wonderfully scenic Achill island, Ireland’s largest island, which is accessible from the mainland via a bridge. Here, a knowledgeable local guide will lead us around the island to visit several points of interest (http://www.achilltourism.com/places.html). We’ll stop off in the village of Keel for a tasy lunch at the Beehive Cafe (http://www.ireland-guide.com/establishment/beehive-the.3877.html) and will have a refreshing walk on the picturesque white sand beach at Keem Bay (http://www.achilltourism.com/keembay.html) . In the evening we’ll be back in Westport for dinner on your own and a session of traditional Irish tunes in one of Westport’s many lively pubs. One famous pub is Matt Molloy's; Matt is the well-known flute player of the famous Irish band, The Chieftains. (http://www.mattmolloy.com/pub_about.html) Also, if anyone is interested, there is a great theater show of the Legend of Grainne Mhoal the Irish “Pirate Queen” at the Westport Hotel, 25 euro a seat (http://www.grainnemhaol.com/#). Day 3. This will be a day where you have some options. Depending on the weather, some may want to stay back for the day and explore the streets of Westport -- shopping, going for walks, etc. (http://westporttourism.com/). The bus will make a visit to the Country Life Museum (http://www.museumsofmayo.com/country-life-museum.htm) in rural County Mayo -- an excellent museum with displays showing the amazing changes in Ireland between 1850 and 1950. We’ll also visit a historic monastic site with an old round tower and abbey. In the evening we will again be on our own for dinner and a trad music session in town. Day 4. We’ll pack our bags and move south through gorgeous scenery to County Galway. We’ll drive along the edge of Clew Bay, pass through the town of Louisburgh and head down through the atmospheric Doo Lough Valley, stopping for a hike if the weather allows. We’ll proceed on past beautiful Ashley Falls and through the towns of Leenane and Maam before stopping off for a look at the picturesque Kylemore Abbey (http://www.kylemoreabbey.com/). We’ll arrive in the scenic village of Clifden in the late afternoon and check in for our three night stay at the Station House Hotel (http://www.clifdenstationhouse.com). After some time to rest and refresh, we will have our second group dinner followed by a private concert by a local Galway songwriter at the Hotel. Day 5. Weather permitting, we drive to the small fishing village of Cleggan, from where we’ll catch the 40-minute ferry over to Insihbofin (http://www.inishbofin.com/), a very beautiful, peaceful, low-paced island. We’ll get the chance to stroll around the island on foot, or rent a bike, or take a mini bus guided tour of the island. We'll return back to Cleggan on the late afternoon ferry and drive back to Clifden for a rest before heading out for dinner and a music session in the local pubs. Day 6. We’ll tour around the Connemara region in the morning -- driving to the small fishing village of Roundstone (http://www.roundstone-connemara.com/) before returning to Clifden for a walk on the Sky Road, which offers great views out to the sea. The afternoon will be a 'free afternoon' to explore Clifden, shop, read, golf, hike or just relax. In the evening we’ll again have dinner and music on our own in the local pubs. Day 7. We’ll pack up and head south to County Clare. We’ll drive through some wonderful Connemara scenery and on to Galway City, Ireland’s third largest city, where we'll stop for lunch and a stroll up Shop Street – a pedestrian mall with shops, cafes, buskers, bookshops and pubs (http://www.360cities.net/image/galway-shop-streetutm_medium=all_images&utm_source=google_earth#0.20,0.00,90.0). From Galway we’ll drive on to the quaint town of Doolin (http://www.doolin-tourism.com/), renowned for its traditional Irish music scene, and check into our accommodation, which will be at either B & B’s or a small, comfortable hotel. After check-in and a rest, we will meet at one of the local pubs for dinner on our own followed by rousing Irish trad music. Day 8 . 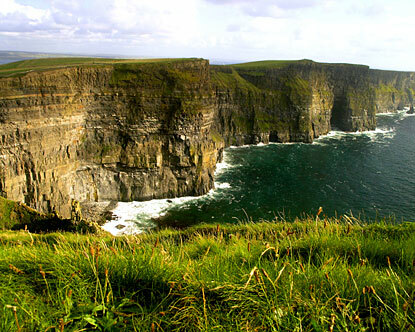 We will tour parts of County Clare starting with one of Ireland’s most spectacular and well-known sites, the Cliffs of Moher, with breathtaking views overlooking the Atlantic Ocean (http://www.cliffsofmoher.ie/). From the Cliffs we’ll drive to Caherconnel ring fort heritage center for a look at the ancient fort and also a sheep dog demonstration (http://www.burrenforts.ie/) . In the evening we’ll meet at another local pub for more great music, food, and fun. Day 9. Today is our last full day together. We will tour the Burren region of County Clare (http://www.galway.net/galwayguide/visit/burren/) and listen to a presentation by a local person about the region. The Burren is unique limestone landscape with plenty of historical sites including ancient tombs, stone forts, old churches and graveyards. We’ll make a stop at the Poulnabrone Dolmen (http://www.megalithicireland.com/Poulnabrone.htm) and return to Doolin on the spectacular Black Head drive along the edge of Galway Bay. In the evening we’ll have our last group dinner and a final“go around” of farewell thoughts on the tour, a few songs, many hugs, and possibly a few tears. Day 10. We head back to Shannon Airport in the morning. Be sure to let us know your departure time if you fly home, or whatever other arrangements you have made for the rest of your vacation -- renting a car, taking a bus, etc. 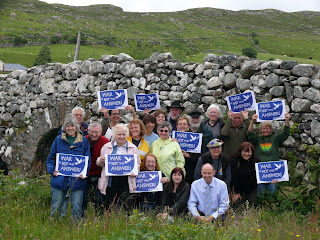 You’re interested in my tour, so I hope you’ll enjoy meeting some of my Irish activist friends. Note: Most folks come on our tour in large part for the music. Most music sessions (a group of Irish musicians playing traditional jigs, reels, and songs, usually unplugged) begin around 9:30 pm, sometimes 10 pm, and continue til around midnight. This can be a bit late for most Americansat first. So be prepared for late nights. The flip side of the coin is that we don't head out most mornings until 10 am, so you can either sleep in or go a walk before we leave for the next day’s activities. And you are always free to stay in any night. We pride ourselves on our flexibility. Also, a free full Irish breakfast is provided B & B style at each hotel, normally in the dining room. Usually between approximately 8 - 9:30 am. We want you all to know that if for any reason you prefer to sit out any of our planned day or evening outings to do something on your own or just relax, that is perfectly fine. Just let us know so we know how many heads to count on the bus. I'd love to have you join us! You’ll be welcome indeed! Lauren Grefenstette, Jesse Dalton, Jim Marks, Shannon Metcalfe, Blanka Engstrom, Shelley Kessler, Tom Weldon the younger, Art Deckard, Ed McCahill, Bill Obermeyer, Art Deckard, Bob Barnes and Maryellen Deckard. 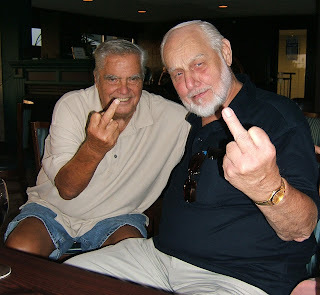 Happy January Birthdays. Amy and Mike are on their 'working honeymoon'. Mike is accompanying Mary Gauthier on a Caribbean cruise. Dan and Monique and Sebastian are back in Zimbabwe. Monique's pregnancy is going well. Julie is back in Sweden. My last MRI was unchanged and the doctored scheduled the next one for March 2013. In the meantime, I took a fall and put my bottom teeth through my lower lip. I go on Medicare on February 1st! Here's a photo of me singing at the Labor Campaign for Single Payer Conference last weekend in Chicago. If you zoom in, you can see my bruised & swollen lower lip. The battle for single payer continues - and as the Affordable Care Act becomes implemented, its many shortcomings will be revealed. We can't control costs until we get the insurance industry out and get rid of the ruthless profiteers in health care. My pal Phil Keyes made it onto the top of the liver transplant list. He was in the hospital less than a week and he sounds terrific! I'm hoping to get to Tampa in March to see him. If you're in Pittsburgh on Saturday, I hope you'll go see Peter Yarrow in concert, sponsored by Calliope, our folksong society. REMEMBER, EDDIE AND JERRY AND SAY: "DUMP THE BOSSES OFF YOUR BACK!"